One bite was all it took & I was hooked! 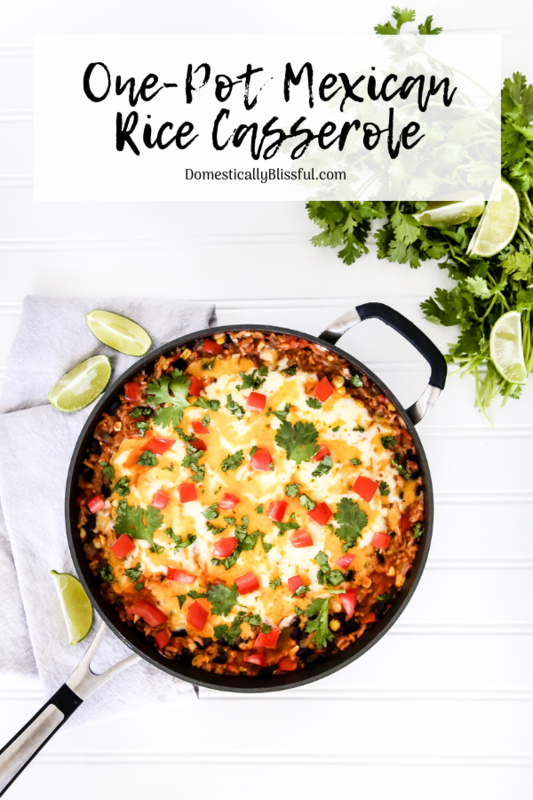 I would keep on rhyming about my love for this One-Pot Mexican Rice Casserole, but you may begin to think I was crazy so instead, I’ll share with you some of my favorite things about this easy Mexican main dish. To begin this recipe on the right note, I used Mazola® Corn Oil. A clinical study showed Mazola Corn Oil reduces cholesterol 2x more than extra virgin olive oil. To learn more about this claim, see MAZOLA.com. Now about the flavor in this Mexican dish… The pop of fresh corn, the crunch of fresh pepper, & aroma of fresh cilantro is incredible! 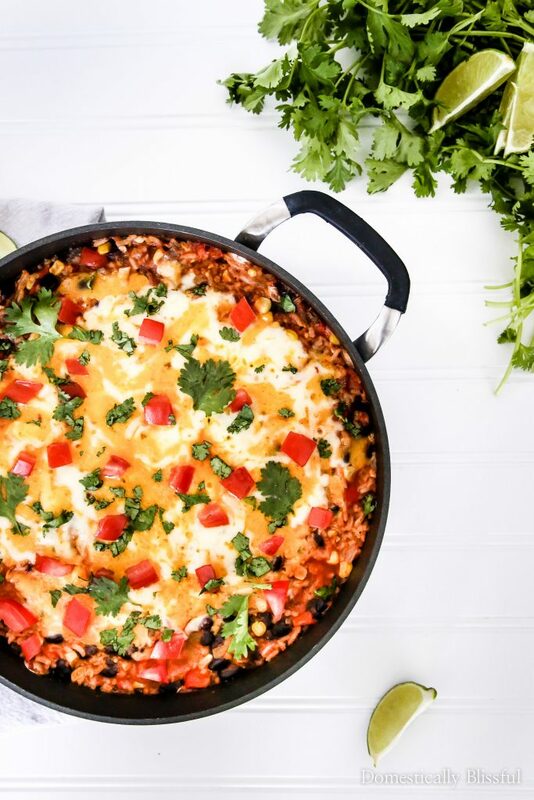 This Mexican one-pan recipe is full of fresh colorful flavor! Normally I pile up the sour cream on my Mexican food, but this recipe has so much flavor I didn’t even add a small dollop! Even my husband was amazed that I didn’t add any sour cream! It is that good! This recipe is so good & so easy to make it may just become a staple dish in your family. I especially loved the cilantro & lime juice flavor addition. I feel like they always bring Mexican dishes to the next level in the flavor department. Speaking of flavor Mazola Corn Oil has a neutral taste that lets the natural flavor of your food stand out. 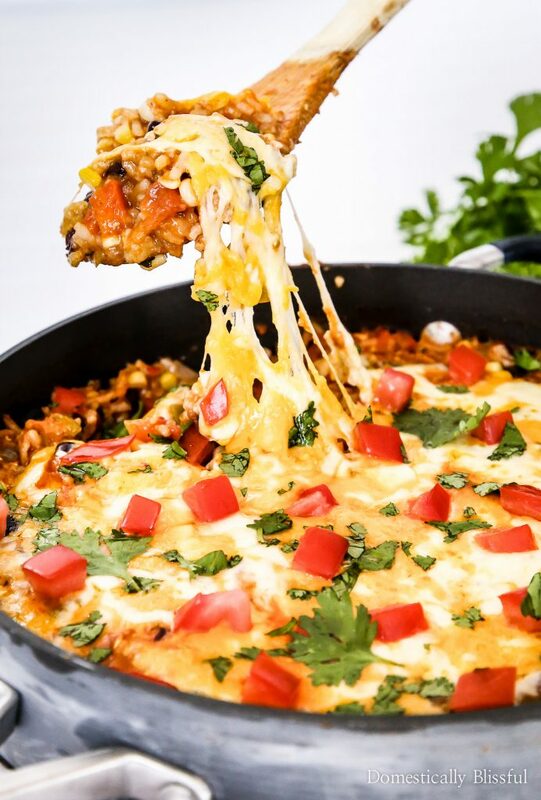 So you really can taste each level of flavor in this One-Pot Mexican Rice Casserole. And it’s not just good as the starting point of this dish, Mazola Corn Oil is an all-purpose cooking oil that is a smart heart-healthy choice for your family. Corn Oil can be used in everything from baking to grilling, sautéing to stir-frying, or mixing up a marinade or dressing. Mazola has a smoke point higher than most cooking oils at 450°F & performs well in a variety of cooking applications, including stir-frying, sautéing, grilling & even baking. Many home cooks may not realize that all cooking oils have a smoke point that, once exceeded, not only negatively affect the food’s flavor & nutritional value. I was definitely one of those home cooks who did not realize this until now! Since the baking season has just begun I have a feeling we will be using this Corn Oil even more in the coming weeks & months. I love that we can reduce saturated fats & cholesterol in our meals easily with simple swaps, such as substituting butter with Mazola Corn Oil. I can’t wait to start recipe developing with it in more recipes this fall! Speaking of swapping things up. 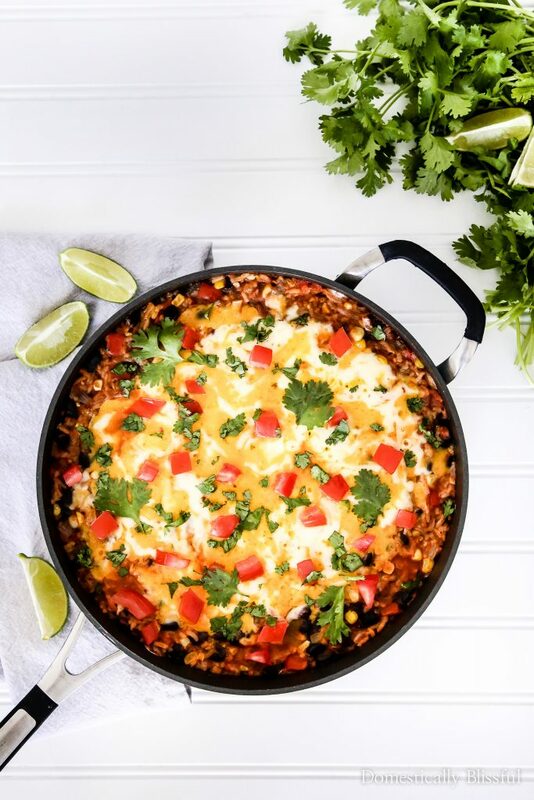 Not only did I choose to swap extra virgin olive oil for better-for-you Corn Oil, but I also swapped frozen corn for fresh corn & canned tomatoes for fresh tomatoes in this One-Pot Mexican Rice Casserole. These simple swaps make this dish so much more delicious! 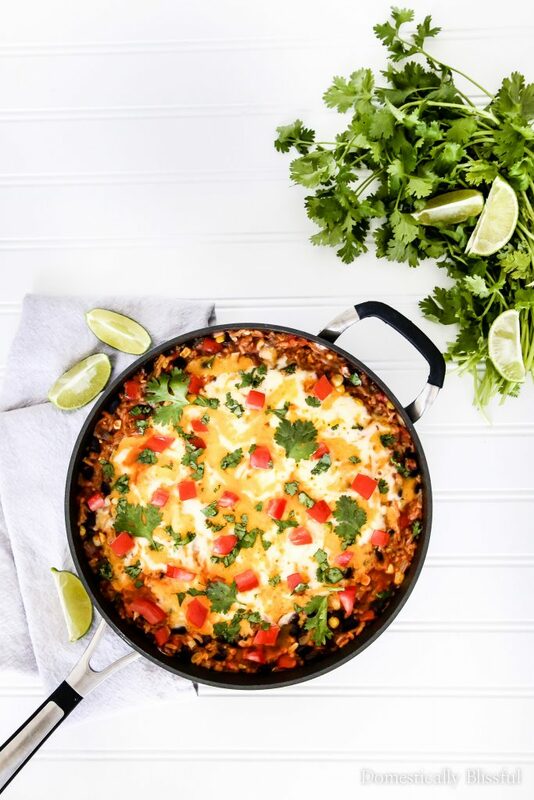 And now that my mouth is watering from thinking & writing about this One-Pot Mexican Rice Casserole, I may need to take the 15 step walk from my desk to the kitchen to eat some more! 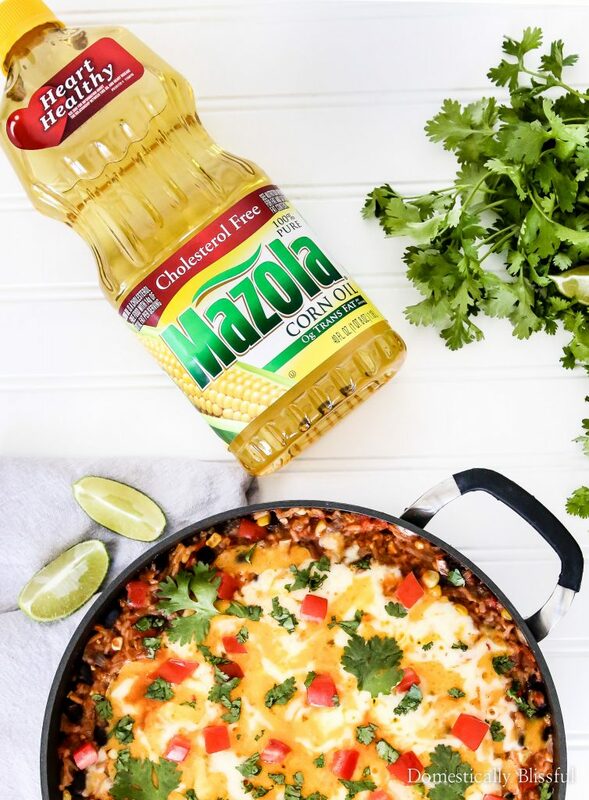 But before I do, be sure to comment below & share your favorite uses for Mazola Corn Oil & what fresh flavor you love most in this One-Pot Mexican Rice Casserole! 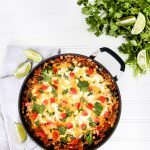 This One-Pot Mexican Rice Casserole is quick & easy to make plus it is full of fresh flavor & bright colors making it a tasty main dish for your Meatless Monday meal. 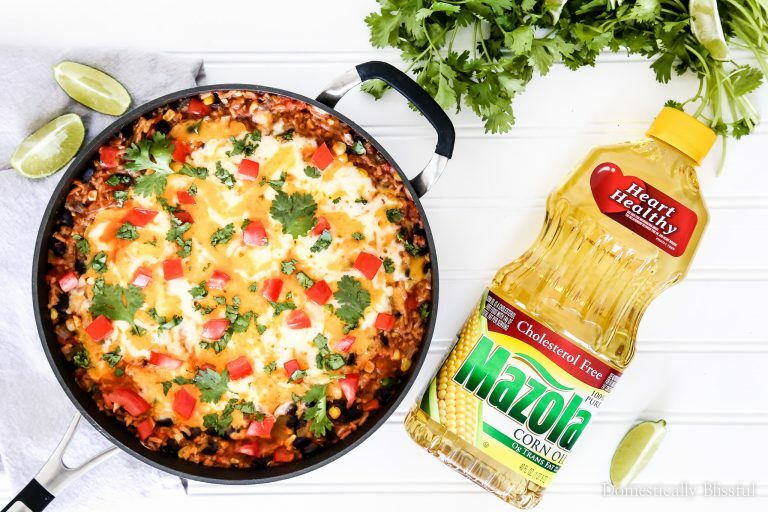 Heat 2 tablespoons Mazola® Corn Oil in a skillet over medium heat then add 1/2 onion & 2 minced garlic cloves. Cook for 3 minutes, stirring occasionally. Stir in 1 diced red pepper, 1 diced tomato, green chilies, 1 teaspoon salt, & 1 & 1/2 teaspoon cumin. Cook for 3-5 minutes or until the pepper is tender, stirring occasionally. Mix in 1 cup corn, & 1 can black beans, 2 cups rice, enchilada sauce, 3 tablespoons cilantro, & the juice from one lime. Cook for 5 minutes, stirring occasionally. Add cheese, cover pot with lid, & cook for 3 minutes or until the cheese has melted. Serve topped with fresh tomato & cilantro. 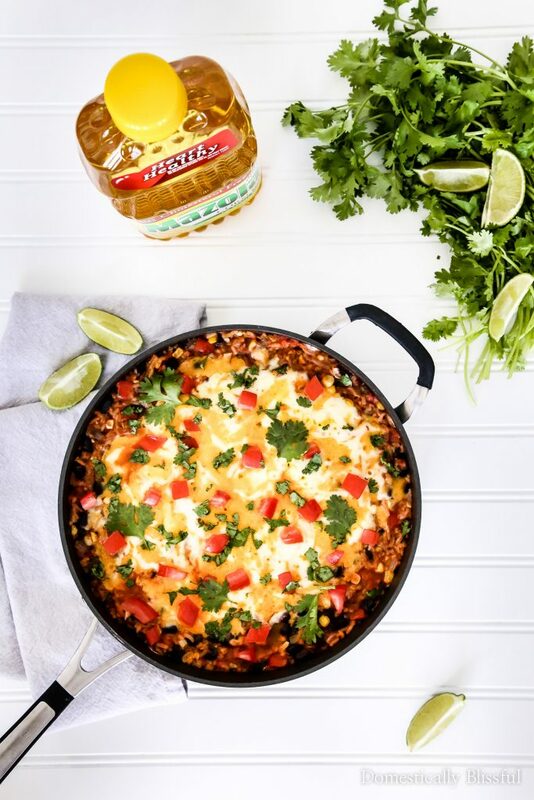 What will you serve with your One-Pot Mexican Rice Casserole?